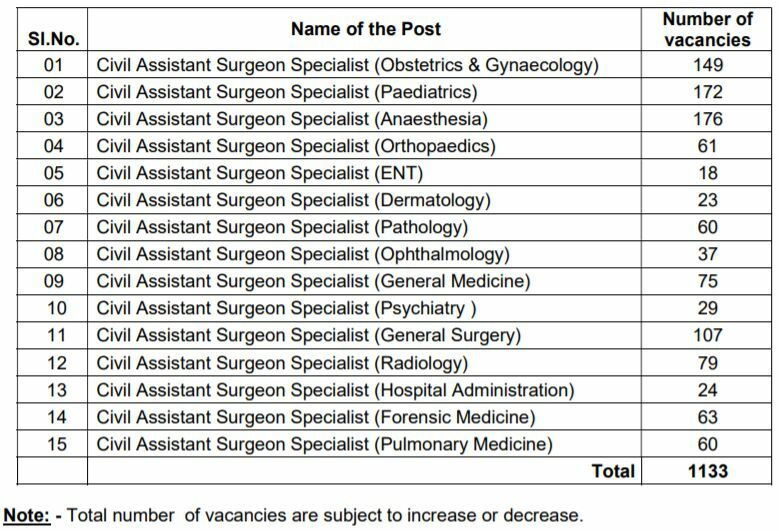 TVVP Civil Assistant Surgeon Specialist Recruitment 2018: Applications are invited through Online from the eligible candidates for appointment on regular basis to the posts of 1133 Civil Assistant Surgeon (Specialist) in various specialities in the Government Hospitals functioning under the administrative control of the Commissioner, Telangana Vaidya Vidhana Parishad, Telangana State. Candidates shall apply for the posts mentioned in the Notification under the control of the Telangana Vaidya Vidhana Parishad, Telangana State, Hyderabad for appointment on regular basis only through „ONLINE‟ at website www.tvvprecruit.telangana.gov.in from 05-04-2018 at 5.00 PM to 04-05-2018 at 11.59 PM. (i) Fee of Rs.600/- need to be paid Online using Payment Gateway through Net Banking / Credit Card / Debit Card. (ii) The Fee once remitted shall not be refunded or adjusted under any circumstances. Failure to pay the Application fee will entail total rejection of application. (iii) IPOs / Demand Drafts are not accepted. TVVP ID reference No. will be generated in the subsequent steps shown below and candidates shall make a note of this TVVP ID reference No. for future references, related to the Notification. Must possess Post Graduate Degree/ Diploma examination or its equivalent in the concerned Specialty from a College recognized by the Medical Council of India. Permanent Registration of the additional qualification in the concerned above broad speciality with the Telangana State Medical Council/Andhra Pradesh Medical Council. Not exceeding 41 years as per the provisions contained in the Telangana Vaidya Vidhana Parishad Special Service Regulations,2000 issued in G.O.Ms.No.48 HM&FW (C1) Department, dated 29-1-2000 which are adapted to the State of Telangana through G.O.Ms.No.3, HM&FW (B2) Department dated 07-01-2016 issued by the Government of Telangana . Maximum age limit shall not exceed (41) years as on 01-07-2018. The age concession over and above the upper age limit for Scheduled Castes, Scheduled Tribes, Socially and Educationally Backward Classes, Disabled persons and Ex-servicemen shall be allowed in accordance with Rule 12 of the Telangana State and Subordinate Service Rules , 1996 which are adapted to the State of Telangana through G.O.Ms.No.196 General Administration (Services-D) Department, dated 28-5-2016. The Detailed Notification, User Guide & Information Bulletin will be made available in the website “www.tvvprecruit.telangana.gov.in with effect from 05-04-2018.. Eligible Candidates shall submit their applications through online from 05-04-2018 to 04-05-2018. For latest updates on Recruitment, candidates shall check website www.tvvprecruit.telangana.gov.in regularly.